Pregnant women often suffer with blood pressure problems. One of the responses to this is to have the patient return to their primary care physician or OB-GYN after birth for at least one blood pressure check. 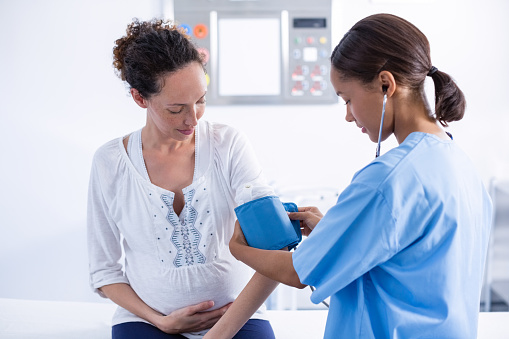 High blood pressure is common after pregnancy and is a frequent reason for readmission after delivery. How Can We Change The Way We Handle This? The University of Pittsburgh Medical Center (UPMC) and its affiliated Magee Women’s Hospital have found a solution. Send every patient who has had blood pressure problems home with a blood pressure monitor and text them on their smartphones, prompting them to measure their pressure and report it. The information goes to a team of nurses who triage the problem and let the women know if they should keep monitoring it. They can also let them know if they should see their physician or go to the emergency room. This information is fed to the EHR system so that medical staff always knows what the results of the home monitoring were. UPMC saw this as an opportunity to expand their existing chronic disease monitoring programs, which use similar concepts for those with chronic obstructive pulmonary disease (COPD). The period of monitoring for postpartum patients with blood pressure problems is about six weeks. It is well integrated with the nurse call center and the electronic health record system. It is noteworthy that UPMC-Magee has achieved success through the use of futuristic wearable or implantable monitors and automatic telemetry with a simple blood pressure cuff and a smartphone. The ingenuity went into the parts of the system that had to work together, not just the technology. The pilot phase of the program, which involved 60 patients, was judged a success. Both unnecessary visits to providers and visits to the emergency room were reduced from the baseline. The same framework is being considered for patients with gestational diabetes. Slightly more than half of the women were able to avoid their scheduled one-week visit for a blood pressure check, and 80 percent showed up for their scheduled six-week postpartum visit, compared to 30-40 percent nationally. The program not only reduces needless encounters but also appears to have a very positive effect on compliance. The UPMC-Magee personnel involved in creating the program stress most of all that such approaches have to be a team effort. Everyone at every level has to be involved in the planning and efforts. It is also important that, as the program is rolled out, everyone involved feels free to report when things are not going well. Particularly with programs in development, it is important not to let dismissal of concerns “bake in” methods and approaches that are just not functional. The other prominent lesson is that one can get high-tech results with low-tech means. Rather than waiting for the development of wearable or implantable automatic monitors, the team decided that the current generation of automatic blood pressure cuffs was more than good enough to give them the information they needed. Text messages on smartphones and their already-existing patient portals were more than good enough to allow for effective communication. So a program that is futuristic in its results got implemented now, rather than twenty years from now. Generally, this effort is another attempt to apply “information engineering” to the daily operations of a healthcare provider, admittedly in a limited area. The team realized that a large number of visits were being done for no reason other than to obtain information (the blood pressure), and that this was a very inefficient way to do it. It required a high level of patient effort and compliance. They also saw that existing technology was sufficient to get them the same information at a much lower cost. What was done under the old system once the information was obtained? If the results were normal, nothing. If they were abnormal, it depended on the provider. UPMC-Magee replaced this with an algorithm, developed specifically for nurses in their call center, to tell patients to do nothing, see their provider, or go to the emergency room, depending on the information gathered. This led to information dictating actions in a clinically relevant, evidence-based way. Finally, the team made sure that the information was not lost; they interfaced it directly with the existing EHR. Ask what you’re doing with the information. Why are you collecting it? Who is acting on it, and why? What happens when they act? Is what happens what you want to happen? If not, how can you change the information flow to produce the outcomes you want? Applying these questions to the fields within medical care is likely to produce a number of positive changes. We have the technology today to provide better medical care at lower costs, but many organizations seem stuck doing things “the way they’ve always done them.” This results in poor efficiency and inflated healthcare costs.